A very valid question and the key words to focus on are –“deep concern”, “helping others understand in a respectful, loving manner…”. The intentions certainly appear to be genuine and if the behaviour is something that can physically be harmful or dangerous to anyone it should be brought to the attention of an adult immediately. However when it is something that is to do with behaviours that we personally disapprove of or have learnt to do so, we have to be extremely cautious and examine carefully the consequences of placing ourselves on a pedestal which is allowing us to conclude if something is ‘good’ or ‘bad’. Sikhi teaches us to stand up for many things. This includes standing up for yourself and others where there is injustice (for example – a girl gets beaten up by her parents or a boy gets bullied because he has long hair and is wearing a turban, help those who are economically disadvantaged etc). Sikhi also teaches us tolerance and most importantly it teaches us that we have to love everyone and everything and that self examination is an essential element for spiritual enlightenment. In that respect, it is crucial therefore to first take care of one’s inner self first before considering anyone else. The culprit, ego, comes in many disguises to fool us – one of it’s masks is – Good Intentions. Whenever I get smitten with the bug of becoming the Good Samaritan and feel like i have to do tell someone something or ‘help’ them, a very close friend of mine constantly reminds me of the proverb- “The path to hell is paved with good intentions”. It is something i still struggle with. It will be good to examine it a bit further. 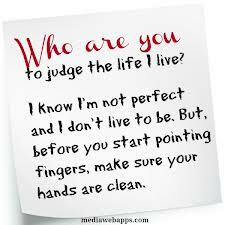 The act of judgement is an act of pride (egotism). It involves looking to our own store of limited intellectual knowledge and coming up with some sort of sentence (approval or disapproval) to a given situation. Sikhism teaches to always remain humble and never to judge someone else in a negative way. Guru Granth Sahib ji is full of verses that emphasize the need to forgive, no matter what; If God is the perfect forgiver, then who are we to judge? We expect others to behave the way we want or think is appropriate without taking in consideration where they may be spiritually and where they are coming from. They may be on a different learning trajectory than us, in fact they may even be more advanced than us. Not all outer behaviour is an indicant of one’s inner self. In Sri Yukteswar’s (Parmahansa Yogananda’s Master) ashram in India, a student once complained that his peer should not be allowed in the ashram because his behavior was not befitting a sanyasin or renouncer. Sri Yukteswar replied that such a student was necessary for the complete training of the students. One who manages to remain a sadhu or mendicant only when he is among sadhus is yet to become one. You have to be grateful to the one who is behaving in a ‘bad way’ since he/she is only an instrument. Don’t allow anger ( a form of suffering or discomfort to fester in your mind). The only one that gets hurt is you. Every time we react to others’ supposedly unjust behavior, we let what we stand for surrender to what we dislike the most. Is that not in itself an undesirable behaviour? The only way we can make any impression on any one else is by being true to ourselves without trying to mould others to be like ourselves. That is their choice, and they are on their own path. He who taught you will also teach them in due course when He wishes it. Our only job is to be LOVE. That’s all. Once, a holy man noticed a scorpion struggling to come out of a pond in order to save its life. He immediately reached for it with his bare hand to save it. The scorpion, however, bit him when he picked it out of water. The holy man, in spite of the pain, did not drop the scorpion. When asked why he did not throw it back in the water when he was bitten, he replied that the scorpion was not separate from him in spite of its different nature. What the scorpion did was natural to it. How could he, then, behave contrary to the nature of a holy man who is supposed to feel and express love for all beings? How can the scorpion in us ever know and learn a different response if its sting is always returned with a sting? By concentrating on a negative behaviour we end up reinforcing it – why not just be a role model that others will want to emulate and choose to see all that is positive in others. Stop blaming. It becomes difficult when you are attached to the idea that the world should run the way you want it to. 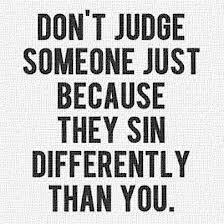 When we judge others it makes us feel superior. In reality it is better to keep all judgments to oneself because one can only claim to know the truth of oneself and not of others. Gurbani urges us to treat others choices with respect. It teaches us not to worry about what anyone else is doing or not doing and challenges us instead to look within, to examine and judge first ourselves, to eradicate our own negativity, bikaars, faults, shortcomings, etc. 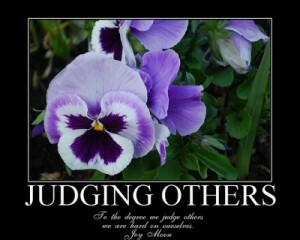 It reminds ua that the instinct of judging is none other than our deluded ego (haumey). Therefore, the scriptures and the wise ones ask us to reverse this attitude by excusing others’ faults and by harshly examining our own. When enlightened beings (sadh jan) point towards our suffering, they only do so to remind us that our natural state is eternal bliss and that we should liberate ourselves from this self-imposed imprisonment. For those who learn to love and forgive everybody, life again gets back on the rails, taking them on a unique and eternal journey of love and bliss. The scriptures ask us to renounce the urge to judge others. They urge us to break the chains of doubts and to remain affectionately unattached. They tirelessly tell us that this rare human life is meant to seek the real Self! We can only pray that we may embark on this journey of self seeking earnestly. With His kind benevolence and our meagre efforts, hopefully we will be able to see within ourselves ‘sins’ or ‘behaviours that need to be adjusted’ before we try to fault with anyone else. The only way is constant sadh sangat and simran. and please help me guard my thoughts too!!! Dear aspiring soul – with your soul searching question, you gave us the opportunity to examine ourselves deep within to find lurking egoistic thoughts that we all need to constantly watch and replace ( see Power of Thoughts). Thank you so much for your courage!! We are so lucky, so infinitely blessed that Guru Sahib has given us such opportunities to reflect and correct ourselves. One such opportunity is this blog post. After conveying my concern to Rani Aunty and reading her reply in this blog post, a lot has become clear to me. In fact, so much has come clear to me that I am already having a tough time wording my scattered thoughts into this post. I sincerely believed that one must stand up to what I thought was disrespectful to Guru Sahib or to the samagam atmosphere. What I didn’t realize is that for 99% of those beliefs, my own ego was talking. Sure, I convinced myself that it was out of my deep concern for the well-being of my fellow sangat kids, which I feel is somewhat true, nevertheless. However, ego is such a tricky player. 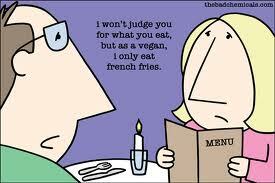 We often bypass it and create excuses for ourselves to justify our many opinions and beliefs. It is quite okay to have those opinions and beliefs, but thinking that they apply to anyone and everyone around us is essentially our haumai pushing out. Through this blog post, it took quite a gigantic blow to my ego to realize that it was, in fact, my EGO that was at play here the entire time. Kut Kut Mai Har Joo Basay Santhhan Kahiyo Pukaar. God abides in each and every one of us, and the Sadh Jan have proclaimed this as true! Why hurt another individual then? Give them love, and keep giving them love. Love is powerful, and through love, ‘thae sukh paaveh neeth.’ Eternal peace shall be found. While we may initially think that individuals behaving “badly” are causing harm, in the end, those supposed “bad ones” give light to the path for those who are seeking to become enlightened Gursikhs of Guru Maharaj Ji. The greatest piece of advice that I received from this blog is stay true to who YOU are. Be the best that YOU can be. Don’t try to change others, but change yourself. To my fellow sangat kids, in order to accomplish this, never forget that Gurbani is the greatest piece of advice ever. Gurbani is your best friend. It is a set of instructions on how to live your life. Always refer back to Gurbani when faced with confusion or tough times because it is guaranteed that 100% of the time, there will always be a revelation to your confusion or concern in a Gurbani pankthee or shabad. In my own life, advice from enlightened beings has always greatly impacted my well-being, but no advice has ever perfectly summed up the answer to my problems as Gurbani does. Ros Na Kahoo Sung Karho Aapan Aap Beechaar, Hoye Nimaanaa Jag Rahuho Nanak Nadhree Paar. Look within yourself and don’t be angry with anyone else. Be humble in this world and with Guru Sahib’s Kirpa, we shall be carried across the world ocean. And with this advice, may we all stay true to being Sikhs of Guru Maharaj Ji through constant Sadh Sangat and Simran. Thank you all for giving me a chance to learn.